On Wednesday, December 20, 2017 St. Augustine High School (FL) quarterback Austin Reed signed his National Letter of Intent (NLI) to attend college and play football at Southern Illinois University, located in Carbondale, IL. The signing took place during the NCAA early signing period at a ceremony in the High School library attended by Austin’s teammates, coaches, former youth league coaches, family and news media. Austin will begin attending SIU during the Summer 2018. The Southern Illinois University Salukis play in the Missouri Valley Conference in Division 1 FCS. 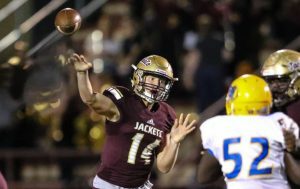 Catching up on the 2017 season accolades earned for St. Augustine High School (FL) Yellow Jackets quarterback Austin Reed. 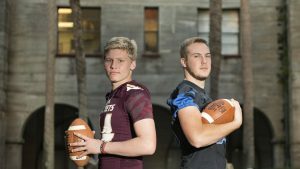 In late December, Austin was named by the St. Augustine Record as the St. Johns County 1st Team All County Quarterback and Offensive Player of the Year for the 2017. 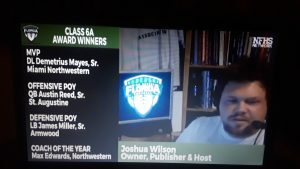 This was in recognition for Austin leading his team to a 12-1, final 4 appearance in the Florida Class 6A playoffs, and throwing for 2,925 yards and 34 touchdowns. You can read the complete article about Austin winning Player of the Year by clicking HERE. In December 2017, the Florida Times Union newspaper (Jacksonville) release the names of their Super 24 prep football players. 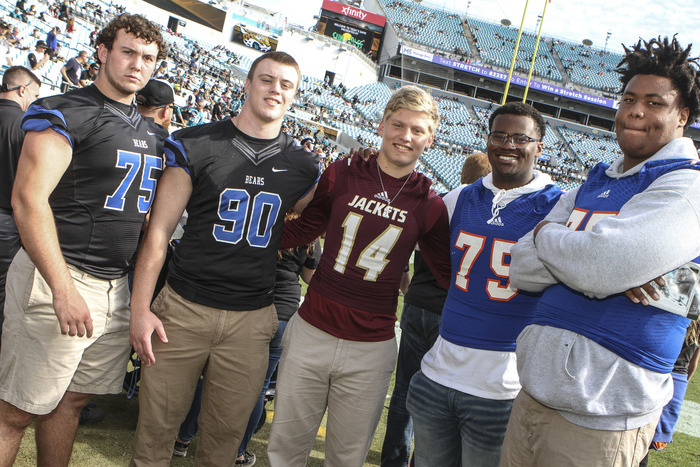 This annual list is an honorable tradition to recognize the top 24 recruits of the 2018 class in all of Northeast Florida. 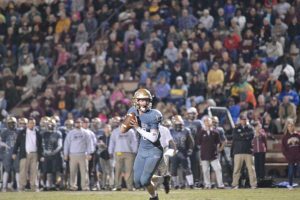 The list is selected by Times Union Sports Editor Justin Barney with input from other local coaches and recruiting analysts. 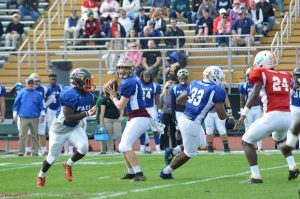 St. Augustine High School Yellow Jackets Quarterback Austin Reed (#14) was selected to be included in the Super 24 for 2017. 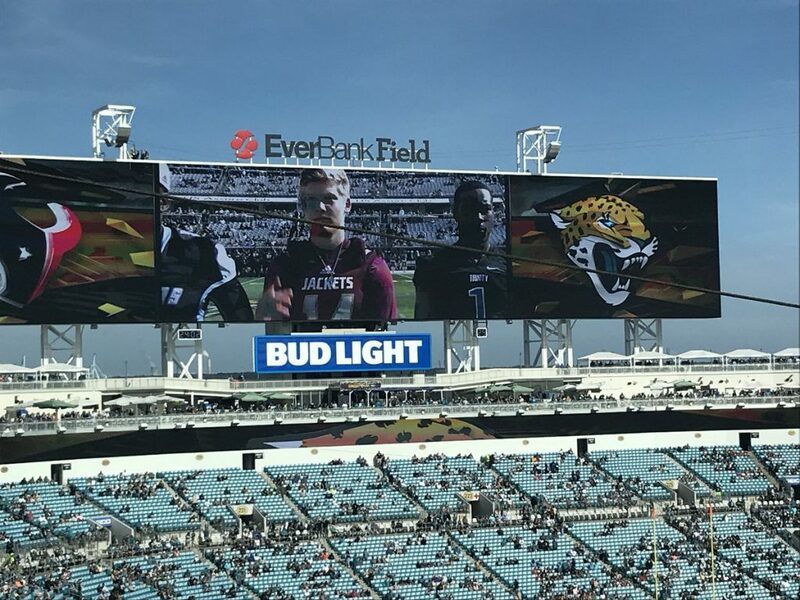 In a ceremony at the Jacksonville Jaguars vs Houston Texans game in Jacksonville on December 18th, Austin and the other Super 24 players and selected Coach of the Year, were honored on the field prior to the game. Click HERE to see the complete 2017 Times Union Super 24. 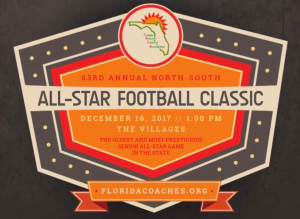 Looking back on the 2017 football season for St. Augustine High School (FL) Yellow Jackets quarterback Austin Reed: On Saturday, December 16th, Austin attended and played in the 63rd annual Florida Athletic Coaches Association North-South All Star Classic held in The Villages, FL. 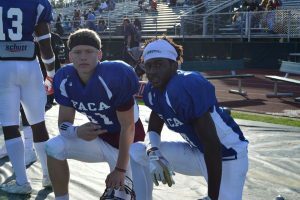 Austin played with fellow Jackets player and long time friend Karim Brown (WR). Starting the game and rotating each drive during the game with QB Marquez Glover from Ocala Vanguard, Austin threw for 240 yards and 1 touchdown during the game. 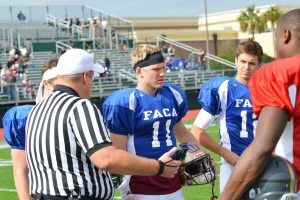 This helped Austin to be selected as the Most Valuable Player for the North team offense from the FACA coaches. St. Augustine High School falls short of getting to the FHSAA Class 6A State Championship. 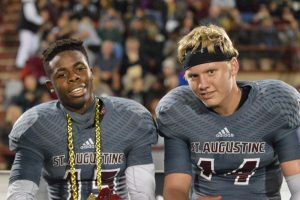 On Friday, December 1st, the St. Augustine High School Yellow Jackets football team traveled to play the Armwood High School Hawks in the Florida Class 6A State Semi-final game. After trailing 16-0 at the half, the Jackets held the Hawks scoreless in the 3rd quarter and came out and scored in the 4th quarter on a 60 yard pass from senior Quarterback Austin Reed (#14) to Karim Brown (#8). However the Hawks special teams and offense proved to be too much for the Jackets in the final quarter, each scoring to increase the Hawks lead to a final score of 30-6. 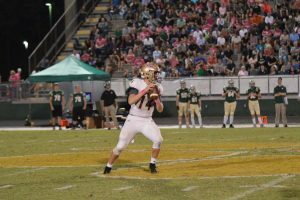 The Hawks held the Jackets to 86 yards on 27 rushing attempts, while Jackets Quarterback Austin Reed completed 19 0f 37 pass attempts for a total of 271 yards, with 1 TD pass. 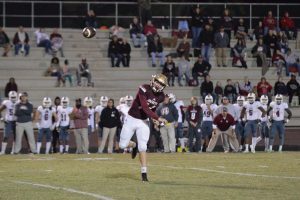 The game ended the season for the St. Augustine High School Yellow Jackets with a final record of 12-1. 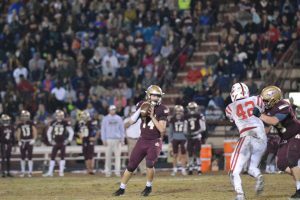 Jackets Quarterback Austin Reed finished the season completing 159 of 248 attempts (64%), 2,925 yards, 37 TD’s (34 passing/3 rushing), 7 interceptions. 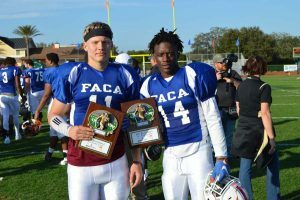 December 19, 2017 | Categories: Uncategorized | Comments Off on St. Augustine High School falls short of getting to the FHSAA Class 6A State Championship. SAHS Yellow Jackets football team defeat Crestview HS for the Region 1-6A championship. 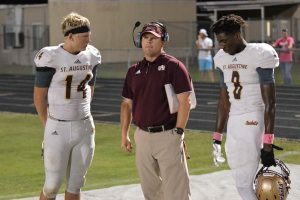 The St. Augustine High School Yellow Jackets football team defeated the Crestview High School Bulldogs last Friday night (11/24) in the Region 1-6A finals by a score of 49-28, to advance to the FHSAA Class 6A semi-final game. The Jackets defense was led by junior defensive end Robert Zuzu (#52), who tallied 3 solo tackles, 6 assisted tackles and two QB sacks during the game, and senior Josh Peterson (#7), had 3 tackles, 7 assisted tackles, and 1 interception return for a touchdown. The Jackets offense was led on the ground by RB Dexter Brown (#15), who gained 199 yards on 31 carries. Brown scored on a 10 yard TD run and added another TD on his longest run of the night for 68 yards. 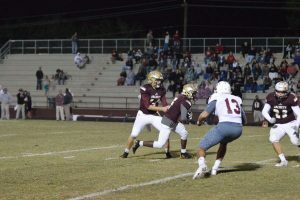 SAHS quarterback Austin Reed (#14) passed for 183 yards, including a 62 yard TD pass to WR Karim Brown (#8), and added to his scoring with a 1 yard touchdown run. Reed increased his TD passes to 33 on the season with 3 TD runs. 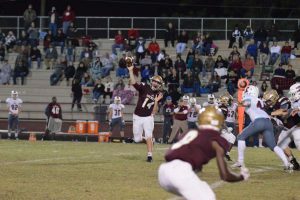 December 1, 2017 | Categories: Game results | Comments Off on SAHS Yellow Jackets football team defeat Crestview HS for the Region 1-6A championship. 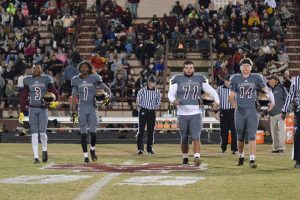 SAHS defeats Navarre HS to advance to the Florida Class 6A quarterfinals. 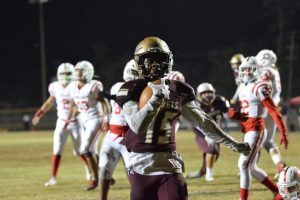 On Friday, November 17th, the St. Augustine High School Yellow Jackets football team defeated the Navarre Raiders by a score of 52-21 in the second round of the Florida Region 1 – 6A playoffs that took place at home in Brumley Stadium. 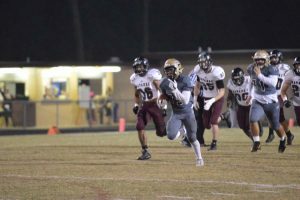 The Jackets offense was led on the ground by running back Dexter Brown (#15) who had a legendary performance of gaining 365 yards rushing on 19 carries, with runs of 55, 80, 80 and 93 yards, all for touchdowns. Dexter increased his season totals to 1,415 yards on 126 carries and 13 touchdowns. 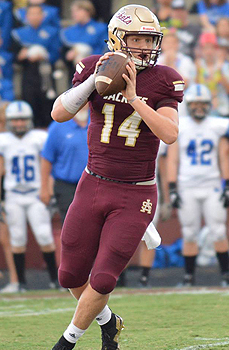 SAHS Quarterback Austin Reed (#14) added to the Jackets 640 yards of offense by passing for 253 yards and 3 touchdowns, each to receivers Karim Brown (2) and Cedrin Daniel (1). The game increases Austin’s season passing totals to 129-191 (68%), 2,471 yards, 32 TD’s/6 Int’s. The St. Augustine High School Yellow Jackets next game is Friday (11/20) at home against Crestview HS in the Florida Region 1-6A Championship game (State quarterfinals). 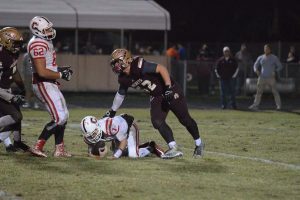 November 24, 2017 | Categories: Game results | Comments Off on SAHS defeats Navarre HS to advance to the Florida Class 6A quarterfinals. 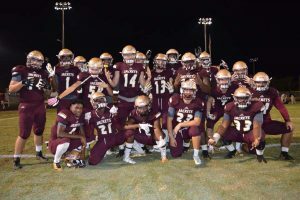 The St. Augustine High School Yellow Jackets football team defeated the Palatka High School Panthers Friday night 42-7 to finish the 2017 regular season 9-0, the teams 9th undefeated regular season in school history. 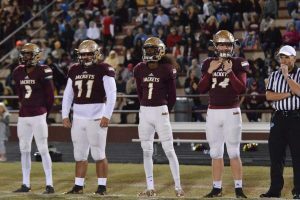 In addition to winning over the Panthers, the Jackets also defeated the Middleburg HS Broncos (38-0) and the Nease HS Panthers (35-23) to win the District 4 – 6A title. The Jackets outscored their opponents 384-93 on the season. 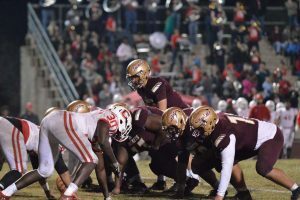 With a perfect 9-0 season record, the SAHS Yellow Jackets football team received the #1 seed in the Florida Region 1 – 6A playoffs and will host Tate HS (Pensacola) in the first round of the playoffs on Friday, November 10th at 7:30 p.m.